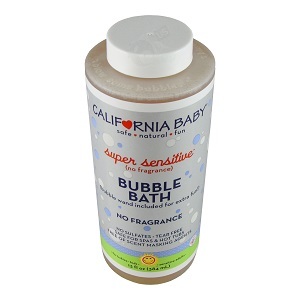 Our Super Sensitive Bubble Bath eschews essential oils in favor of pure, unscented bubbles. This bubble bath has been specially created for those who love bubble baths but have very sensitive skin or cannot tolerate any fragrance. No fragrance means allergy sufferers and those following homeopathic regimens can enjoy bubble baths safely. Our bubble baths are free of Sodium lauryl sulfate, DEA, synthetic fragrances or synthetic additives for no tears, non-irritating, biodegradable bubbles. Children (and adults!) 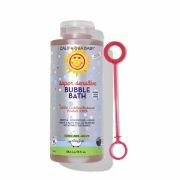 love bubble baths--so we make them safe and of course a bubble wand is included for frolicking and extra fun! Because this is not a synthetic bubble bath you must help the bubbling process by shaking/agitating bubbles under vigorously running water at the start of tub filling. When adding our essential oil blends drop into bath once bath level has been reached. 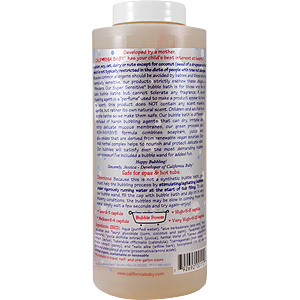 Especially appreciated by women because the non-irritating formula does not promote yeast or bladder infections. Super Sensitive Bubble Bath is shipped in a discrete, unmarked package. Orders are processed immediately and usually take about 3 to 5 working days to be received. We do ask that you try it for 2 to 3 weeks to feel the full effects. Any information received is used only for order processing and shipping purposes. Your information, such as e-mail address, will never be disclosed to a third party.